Just so you know, I flipping love this dress! The bodice is the good old By Hand London Anna bodice, and the skirt is a half circle skirt cut on the bias. The inspiration was this vintage dress I found on Pinterest. I wish I'd paid a bit more attention to how the lines are matched on the skirt centre front - oh, well! The fabric is some polyviscose suiting from a seller called The Textile Centre on ebay. It's lovely, and has a woolly feel to it; also, it was only £4.49 per metre. Everything was cut on a single layer to match up the stripes on the tartan. I think I could sew an Anna bodice in my sleep, so that bit was easy, but the bias front and back seams took a few goes to get them perfect. One side of the centre back zip got unpicked three times, but I got there in the end. Oh, and I also stablised the bias cut edges of the skirt zip seam with some interfacing which worked perfectly. As already mentioned, I love this dress, and it has been worn a lot already. The fabric is lovely and cozy for the cold weather. As far as I am concerned tartan is a neutral, and I may have found some small check Black Watch tartan on ebay, which is being turned into a shirtdress at the minute! 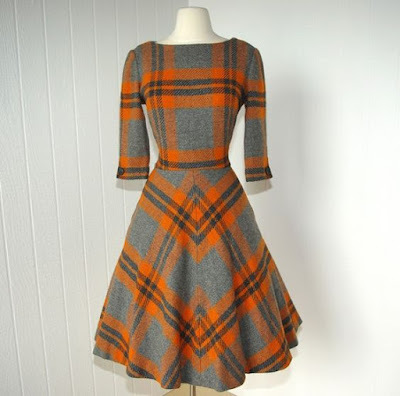 Great dress..and I totally agree that tartan is a neutral. Thank you! Who doesn't love a bit of tartan?! Love this dress Lynne. I think tartan looks particularly great when it's on a garment with curves. Thank you! I agree, the curves compliment the straight lines. Perfect tartan matching. I've never thought of tartan as a neutral before but there you go - you learn something every day! Thank you! I also think that red is a neutral too!! Thank you! It's a bit of a faff matching the pattern, but it's always worth it. It looks lovely and your pattern matching skills are amazing! Thank you! It's always pleasing when the pattern matching works out well! Thank you! I really loved the colours in this fabric. I'm not surprised you love this dress - it looks great! I do love tartan, but don't sew with it often because I'm always put off by the effort of pattern matching - you've done a great job of that here! Thank you! My top tip for tartan matching is to mark the seam allowance on the paper pattern, and match the lines to it. Thank you! I love how it's turned out. Thank you! I'm so pleased with how the skirt turned out.